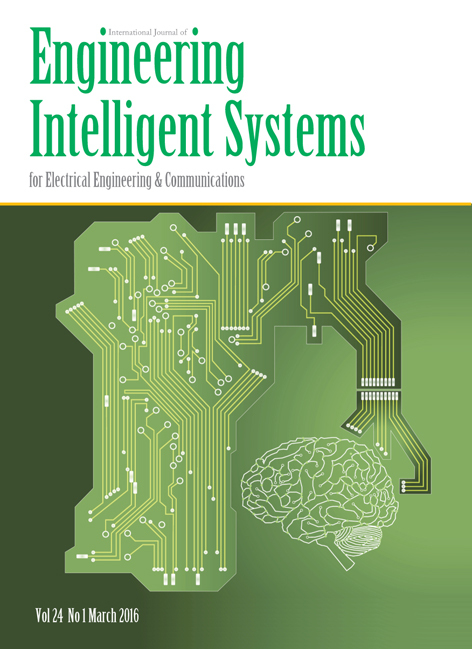 Engineering Intelligent Systems for Electrical Engineering and Communications is devoted to the publication of high quality papers in the field of intelligent systems applications in numerous disciplines. Original research papers are invited for publication. All papers will be refereed by acknowledged experts in the field, and may be (i) accepted without change, (ii) require amendment and subsequent re-refereeing, or (iii) be rejected on the grounds of either relevance or content. The submission of a paper implies that, if accepted for publication, it will not be published elsewhere in the same form, in any language, without the prior consent of the Publisher. It is the author’s responsibility to obtain written permission to quote material that has appeared in another publication. All submissions should be accompanied by a written declaration that the paper has not been submitted for consideration elsewhere. Papers should be submitted to the journal’s Editor-in-Chief via the online submission system. As a last resort, papers may be sent to the address below, but we do encourage online submission as it makes the process easier and faster. Manuscripts should be submitted to the Editor-in-Chief for publication. They will undergo a thorough refereeing process prior to acceptance. Authors may be requested to revise their papers, or the Editor may reject a paper for publication. Manuscripts should be prepared on a computer in a common software format to help the typesetting of accepted papers. Authors should write in clear and concise English. Papers should normally be about 8000 words in length. Submission should be made through the journal’s online submission portal electronically. Authors should not use DTP software, or attempt to follow the journal’s layout style. Figures and tables should be prepared electronically and sent in a common format like JPG or PDF. Figure labelling should be no larger that 10pt. All graphical elements should be at least 300dpi in resolution, preferably higher for line drawings and tables. Title. authors, affiliation and full postal/email addresses. A 50–100 word abstract outlining the purpose, scope and conclusions of the paper. The text, suitably divided under decimally numbered headings. References (as complete as possible). The minimum of descriptive text should be used on figures, with essential information relegated to the figure caption. Graph axes should have the variables labelled in full, with the abbreviation in parentheses. Scale grids should not be used in graphs unless necessary for actual measurements. Indicate references to the literature in the text using one of the main citation systems (Harvard, Vancouver). Where a reference is cited more than once in the text, use the same number each time. References should be complete as far as possible, including the year of publication, the publisher and their location, full article, book and conference titles, full list of authors and their initials, and page numbers where appropriate. Correspondence and proofs for checking will be sent to the first named author by email unless otherwise requested. Proofs are sent via email in PDF format, and corrections should be returned within two weeks. Should proofs not be returned during this period, it will be assumed that there are no corrections. Only typesetting changes can be accepted from authors at proof checking stage. Offprints can be ordered from the Publisher (minimum order 100). Offprints must be ordered when returning corrected paper proofs. Details are sent to authors with their proofs for correction, along with a Copyright Transfer form. Before publication, authors are requested to assign copyright to CRL Publishing Ltd. This allows CRL Publishing to sanction photocopying, and to authorize the reprinting of issues or volumes according to demand. Authors’ traditional rights will not be jeopardized by assigning Copyright in this way, as they retain the right to reuse the material following publication, and to veto third-party publication. The journal is available to purchase online to individuals only. Institutions must subscribe through their usual subscription agent. The journal is available in print only, there is no downloadable online edition. Institutional subscription rates for 2019 can be found here. The contents of Volume 27 will be listed when available.